Which is not to say, people haven’t had problems. When they do, we’ll try our best to report them and—even better—pass along any solutions we here about. Take the case of reader Jud White who upgraded to an iPhone 3G S from his original iPhone. Just one problem—visual voicemail wouldn’t set up for him. 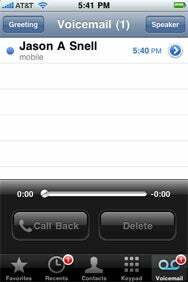 When he tapped the icon, instead of showing the visual voicemail screen we’ve come to know and love, Jud’s phone would place a call to voicemail. A call to Apple tech revealed that he wasn’t the only person experience this problem Friday. Sign into AT&T’s Web site and select your phone/device. Choose Reset Voicemail Password on the right column. Click submit when the site asks you if you want to reset your password. Thanks for the tip, Jud. Hopefully, you’ve saved other iPhone users some bother.